LATEST UPDATE: Friday morning at 11:37 a.m.
As of 11:30 Friday morning, the South Canyon fire near mile marker 112 westbound on I-70 is 100 percent contained, according to Glenwood Springs Fire Chief Gary Tillotson. However, Tillotson said the fire isn’t considered fully under control by the Bureau of Land Management as there may be some internal hot spots inside the containment lines. Firefighters are expected to monitor the fire throughout the weekend, but won’t be doing any active work on the mountain. Tillotson added that no more closures on I-70 westbound are expected. As of Friday morning, the fire investigator has not determined a cause. UPDATE: August 9, 2018 at 2:05 p.m. 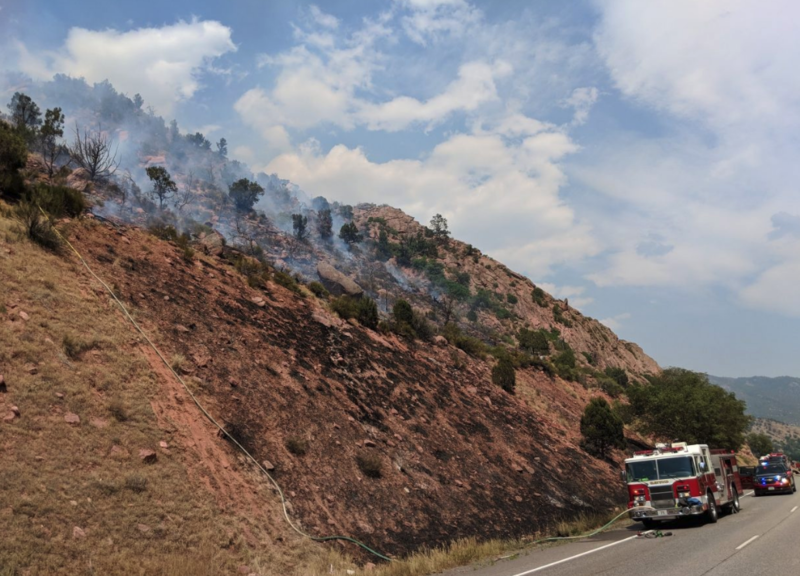 The 113 Fire burning alongside Interstate 70 in South Canyon was considered to be 95 percent contained as of mid-afternoon Thursday, with a goal of 100 percent containment by day’s end, according to an afternoon update from the Garfield County Sheriff’s Office. Both lanes of westbound I-70 were expected to open to traffic by 4 p.m. today, but fire operations will continue in the area and equipment and firefighters will be present on the shoulder. Today’s efforts included 25 firefighters and equipment from various agencies. No further aerial drops of water were used and none are planned for today at this time. MORNING UPDATE: While no containment was lost on a fire burning alongside Interstate 70 at mile marker 112 in South Canyon, the containment number has been revised from 95 percent reported Wednesday evening, to 70 percent Thursday morning, according to Glenwood Springs Fire Chief Gary Tillotson. As of 7 a.m. Thursday, the containment number was revised to 70 percent with the fire covering 4.5 acres. Tillotson said that the 95 percent containment was an overestimation last evening, but the fire did not spread overnight. Firefighters are expected to work on fire lines throughout the morning to fully contain the fire, while an investigator is scheduled to arrive Thursday morning to try to determine the cause of the fire, which sparked at 2:30 p.m. Wednesday along the westbound lanes of I-70. As firefighters work to build fire line Thursday morning, the right lane and the shoulder on I-70 will be closed throughout the day to ensure the safety of emergency personnel working on the blaze. Tillotson stated that the goal is to have both westbound lanes on I-70 opened by 4 p.m.
At this time, there is no concern for Ami’s Acres or Mitchell Creek, which were placed on pre-evacuation Wednesday afternoon. This story has been revised from an earlier version that was posted. It will be updated with more information as it becomes available.